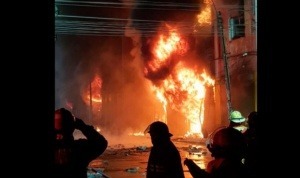 More than 400 firefighters fought with 60 units during the emergency raised in a gallery in Guillermo Dansey street in Lima, Peru. The Fire reached the paint store during more than 18 hours in ‘Las Malvinas’. Although we do not have to regret any dead, up to 5 firefighters were reported injured, one of whom will undergo surgery. A big fire was registered last week in a gallery of hardware materials, located in the avenue Guillermo Dansey, near the av. Argentina and the well-known Las Malvinas shopping center. The incident was classified as code 4, that is, out of control. The flames consumed floors 2 and 3 of the building and they reached the ceiling. This gallery is used as a warehouse for the local hardware dealers, so it is full of paint buckets, PVC pipes, among other flammable materials. More than 30 rescue units approached the area, in addition to cisterns and an ambulance. Also the vehicular traffic in the zone was closed to facilitate the work of the firemen. This fire reminds us of what happened in the Terminal market in Guatemala, which to date was the largest market in Central America. It is a priority to take into account all the preventive measures, passive fire protection and smoke evacuation in these locations, where there is a large influx of people.